Ms Lauren Cole, the Diocesan Youth Ministry Coordinator for the Rockhampton Diocese has been award a full scholarship to study the BBI-University of Newcastle Graduate Certificate in Theology, specialising in Youth and Campus Ministry in 2012 and 2013. Lauren has been working for the Rockhampton Diocese for 12 months. 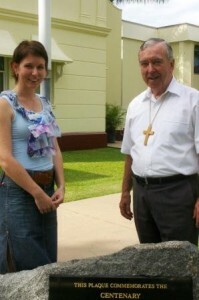 She previously worked in the Townsville diocese with the Young Christian Students movement. Lauren was ecstatic to receive the news of her successful application. “It is fantastic to be offered this opportunity as this is something I have always wanted to do,” said Lauren. “I am so excited about this chance to study and I am looking forward to deepening my understanding of youth ministry as it will allow me to carry out my role and mission at a much deeper level”, she said. This Youth Ministry Scholarship is a first for the Church in Australia and has been widely acclaimed and promoted. Malcolm Hart, Senior Youth Ministry Projects Officer for the BCPL, identified that there has been positive feedback from all over the country and even internationally. “Youth ministers and church leaders have praised this opportunity for emerging and established youth ministers” said Malcolm. “It supports the outcomes of the Bishops Youth Leaders Gathering in 2008 which identified the need to have comprehensive training opportunities in youth ministry”, he said. BBI Director Gerard Goldman expressed his happiness at being involved in such a positive opportunity for those who are committed to sharing the message of Jesus Christ with the youth of today. “BBI is committed to the support and formation of youth ministers in Australia. It has been a privilege to be a part of this scholarship as it highlights the need for lay ecclesial ministry, especially youth ministry, to be supported with appropriate formation experiences which can help connect young people with Jesus through the Church”, he said. Lauren’s full scholarship valued at $5,140 is joined with by two additional part scholarships (valued at $2,570 each). These were awarded to Fernando Farrugia, a Religious Education Coordinator in Adelaide and Christian Nobleza, a Religious Order youth minster in Brisbane. It is hoped that in the future more scholarships of this nature will be made available. The BCPL will liaise with BBI in the coming months to reflect on possible future scholarships. For media enquiries or to arrange interviews with Lauren Cole, Malcolm Hart or Dr Gerard Goldman please contact Beth Doherty on 0407 081 256.